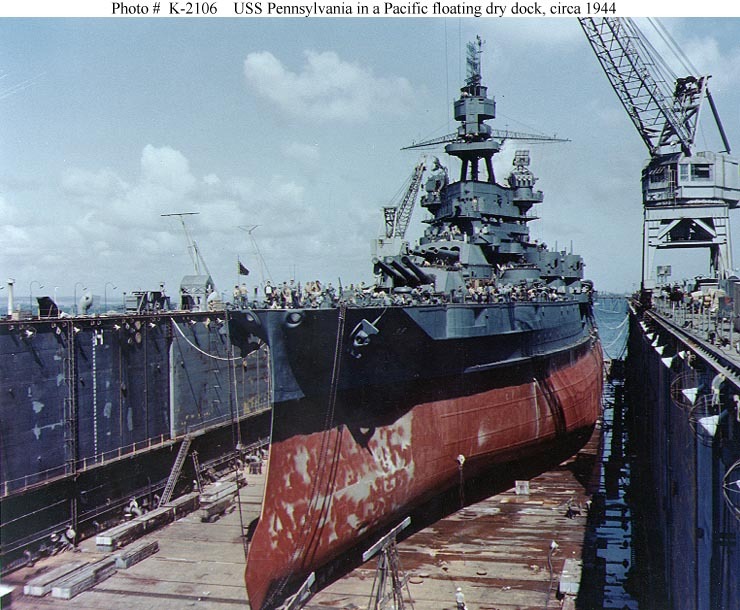 USS Pennsylvania, lead ship of a class of two 31,400-ton battleships, was built at Newport News, Virginia. Commissioned in June 1916, she served as the Atlantic Fleet’s flagship into the early “Twenties”. 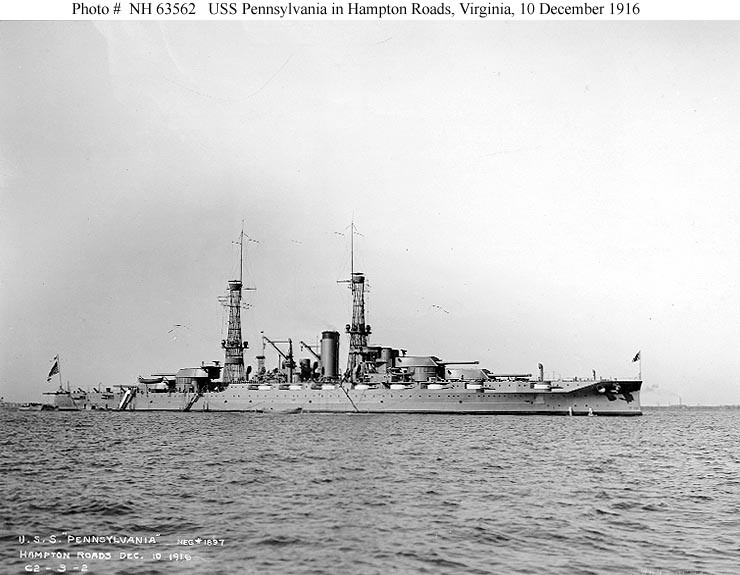 Though her operations during this time were primarily off the U.S. east coast and in the Caribbean area, Pennsylvania briefly cruised to France in December 1918. Transiting the Panama Canal to the Pacific early in 1921, she became flagship of the newly-organized Battle Fleet. During the next eight years, she led the Navy’s battleships in maneuvers in the Atlantic, Caribbean and in the Pacific, including a cruise to Australia and New Zealand in mid-1925. From June 1929 to May 1931, Pennsylvania received an extensive modernization at the Philadelphia Navy Yard, Pennsylvania. She emerged with new “tripod” masts, improved combat systems, and an enlarged armored conning tower to better support her mission as fleet flagship. Through the following decade, Pennsylvania continued her pattern of drills, at-sea exercises and periodic major “Fleet Problems” conducted to refine the Navy’s war plans. 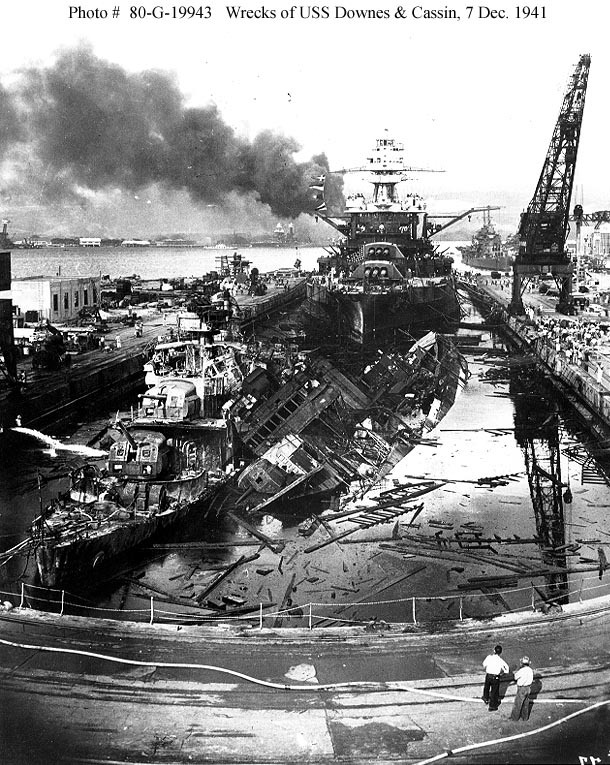 When Japan attacked on 7 December 1941, Pennsylvania, flagship of the United States Fleet, was in drydock at the Pearl Harbor Navy Yard. Her relatively light damage was repaired over the next few months, and she operated along the U.S. west coast and off Hawaii until October 1942. Following an overhaul that significantly updated her secondary battery of 5″ guns and added many anti-aircraft machine guns, Pennsylvania went to Alaskan waters, where she participated in the recapture of Attu in May 1943 and Kiska in August.